Thanks for joining me as we wrap-up the memorization series. Today I want to introduce you to one of my favorite free online tools for memorization, Quizlet.com. This is my go-to tool for working on lists of terms and definitions. I love this site because it is very easy to get started and create a set of terms and definitions. Once you’re set up there are a ton of ways you can work on the set including games you can play, traditional flash cards, and a customizable test mode (my fav). They also have a free mobile app for Apple and Android devices. I find it very useful for studying on-the-fly and maximizing my time. If I am waiting in preschool drop-off line for 5 minutes I will pull out my phone and run a quick test. Quizlet allows you to search through user-created quizlets and you can use any of their pre-built term sets to study from. If you are studying something extremely popular, this may be helpful, but most often you will want to create your own Quizlet to review exactly what you need to know. You will get the biggest impact out of quick-facts. Things like terms & definitions, dates & events, names & achievements, code & its purpose, etc. If you would think about using a normal flashcard, it should work well on Quizlet. A great way to maximize your notes is to turn them into question and answer pairs. These work really well in the Quizlet system to generate quizzes to help you review the material. Pull out your awesome notes and identify the facts you need to memorize. 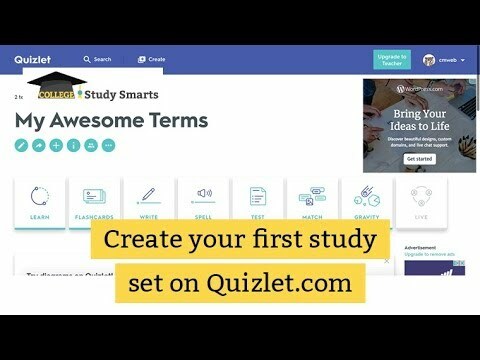 Create a free account at quizlet.com and start your first set. Add your terms and definitions to the set.